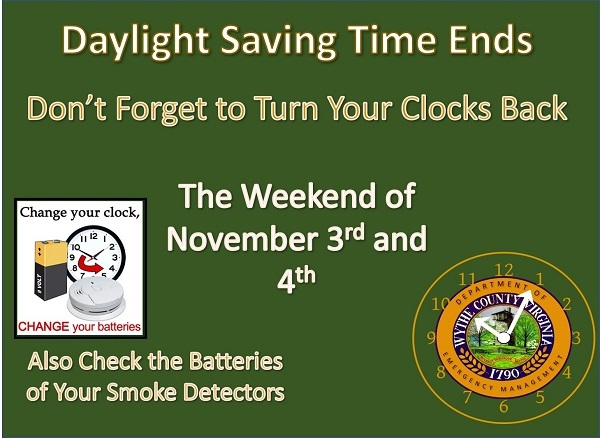 Time change coming up this weekend! WYTHEVILLE, Va. – Super Bowl XXIV & Cheermania will be held this weekend at Rural Retreat High School. The event is hosted by the Wythe County Parks and Recreation Department and the Town of Wytheville Parks and Recreation Department. Cheermania kicks off at 9:30 a.m. and the Super Bowl game starts at 12:30 p.m. on Oct. 27th. Wythe County Sports Coordinator J.B. Wright said everyone is looking forward to having a great time at this year’s event. 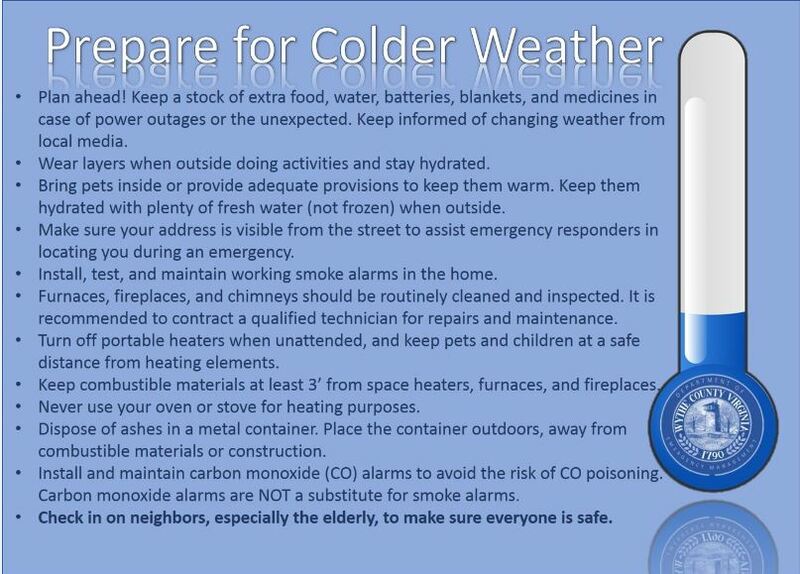 With colder weather forecasted for our area, Wythe County would like you and your family to stay safe. Wythe County has already had and is still forecasted for temperatures below freezing along with precipitation. Here are some initial tips to get you and your family prepared for the colder weather. • Plan ahead! Keep a stock of extra food, water, batteries, blankets, and medicines in case of power outages or the unexpected. Keep informed of changing weather from local media. • Wear layers when outside doing activities and stay hydrated. • Bring pets inside or provide adequate provisions to keep them warm. Keep them hydrated with plenty of fresh water (not frozen) when outside. The New River Regional Water Authority is accepting applications for a full-time Water Operator or Operator Trainee. Successful candidates will be able to exert 10 lbs. of force frequently and 50 lbs. of force occasionally, operate a skid-steer loader, possess good communication skills, knowledgeable with computers, general knowledge of hand tools and chemical feed pumps, and follow written and oral instructions. This position requires candidates to be able to work shift-work, weekends and holidays. Candidate must possess a high school diploma or GED, Virginia driver’s license issued by the DMV and good driving record. As of this morning, Hurricane Michael was classified as a category 4 hurricane. Michael made landfall around 1:30 p.m. After landfall, the hurricane is moving Northwest into Georgia, South Carolina, North Carolina, and then Southeast Virginia prior to heading back out to the Atlantic Ocean. This path is South of our area. The concern is twofold at this time. First, Michael is a very large storm. Our area could get rains from outer bands of the storms. Michael will also be meeting a front coming from the east that should keep it on this path, but bring us rains and cooler weather as the week continues. Second, this could be a changing storm. As we learned from Florence, Hurricanes can change from initial forecasts. 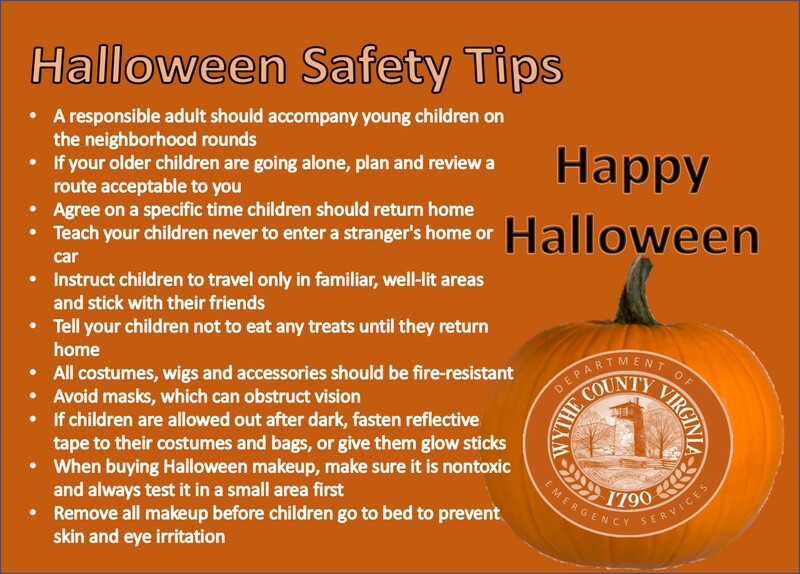 With Halloween coming up soon, the Wythe County Emergency Services Department has provided a few safety tips to keep in mind before the event. Please look over these safety tips to help keep everyone safe! WYTHEVILLE, Va. – Clyde Easter has been diligently working to preserve the memory of all veterans within the mountains of southwest Virginia. For many years, Easter has strived to get U.S. Highway 52 through Carroll, Wythe and Bland Counties designated as Veterans Memorial Highway. Now, his dream is a reality. A dedication celebration is being held at each of the participating counties from 9 a.m. to 2 p.m. on October 20, 2018.